Once again, the film relies on contrast to make a point. The preceding sequence had the clowns celebrating their successful performance. Here, Dumbo is depressed over the very same performance. The performances in this sequence are also contrasting; Timothy is consistently upbeat, failing to rouse Dumbo out of his lethargy. Timothy tries praise and then a peanut, but Dumbo is indifferent to both. Finally, Timothy mentions visiting Dumbo's mother, and that is the only thing that cheers Dumbo up. It doesn't look like Mrs. Jumbo will get a reprieve anytime soon. Her cage is covered in warning signs and within it, she's chained to the walls and weighted down. From an animation standpoint, it is interesting that the personality close-ups of Timothy are done by Fred Moore and Dumbo is done by Bill Tytla, but when both characters share a shot, the are generally done by John Lounsbery and sometimes Tytla. 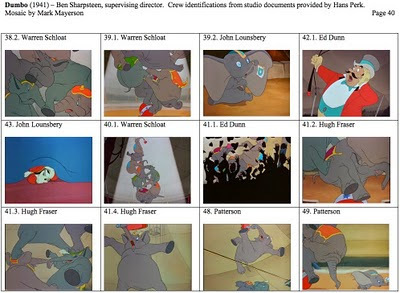 The shared shots contain lots of character interaction, such as Dumbo lifting Timothy in shot 3. It's easier and more efficient to have one animator handle both characters rather than have two animators jointly plan the interaction. 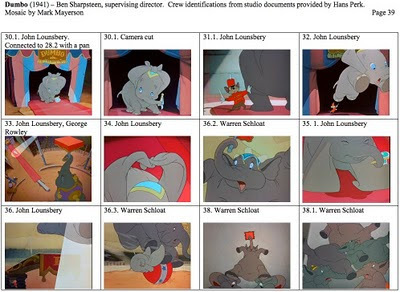 However, that didn't stop Lounsbery from giving Dumbo a bad eyeline in shot 6.1. 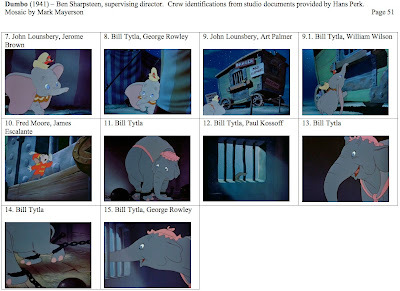 Dumbo's pupils are nowhere near the direction of Timothy. The Mickey Mouse daily comic strip, done for 46 years by artist Floyd Gottfredson, will be reprinted in its entirety by Fantagraphics Books starting in May 2011. The clowns celebrate their success and toast Dumbo. So far the clowns are the only characters beside Timothy to say anything nice about the elephant. 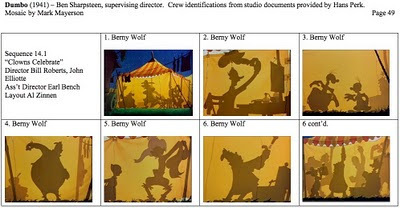 This sequence is wholly animated by Berny Wolf. Take a look at the shapes of the characters in shot 3. 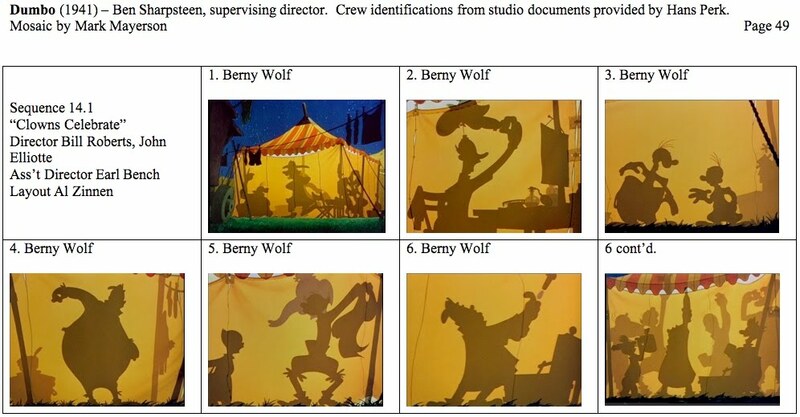 The balloon construction could come out of an early '30s Ub Iwerks cartoon, where Wolf worked prior to Disney. Wolf was certainly capable of work more sophisticated than he did at Iwerks; he animated a good chunk of Jiminy Cricket in Pinocchio. While the designs might be a throwback, the animation is advanced. The poses have beautiful lines of action and read clearly in silhouette. Wolf keeps the arms away from the body so that there is never confusion about the pose. There's great graphic clarity here. 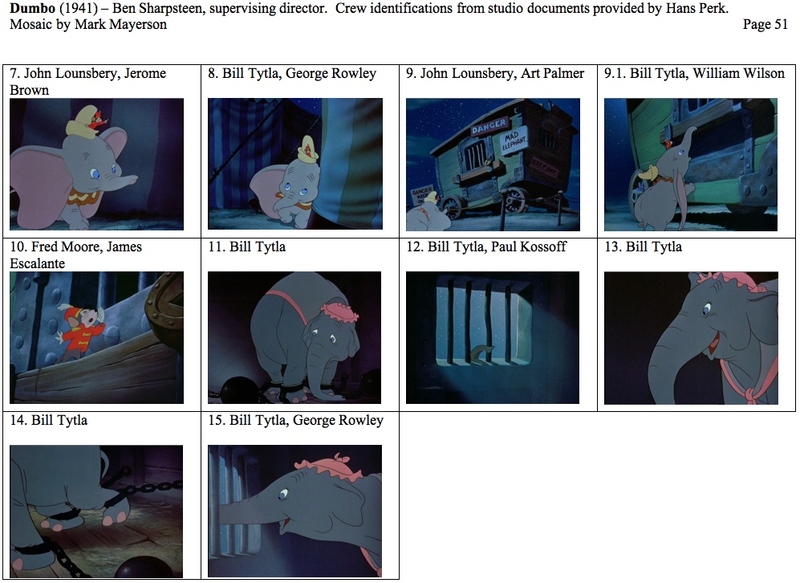 Note that there are two colour tones of silhouette, which prevents background elements in shot 3 or the crowd of clowns at the end of shot 6 from being visually confusing. Even viewing the small thumbnails above, there's no confusion as to what is happening on screen. Billy Bletcher, who was the voice of the Big Bad Wolf in The Three Little Pigs and the voice of Peg Leg Pete in the Mickey Mouse series, makes a cameo appearance here. He's the voice of the clown in shot 2 and is probably also the voice in shot 4. There's an interview with Dean Yeagle over at Super I.T.C.H. Dumbo is now part of the clown's act. There are interesting parallels between this sequence and what's gone before. 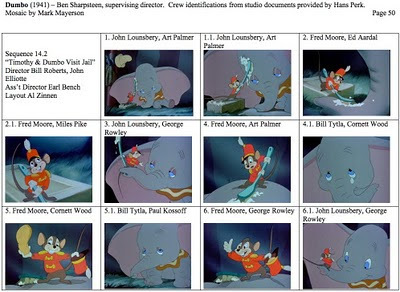 The clown with the elephant head is shrieking "Save my baby," so Dumbo's situation is a parody of his mother attempting to protect him from kids on the midway earlier in the film. In this act, a clown whacks Dumbo's rear to get him moving as Timothy did to get him moving in the pyramid sequence. 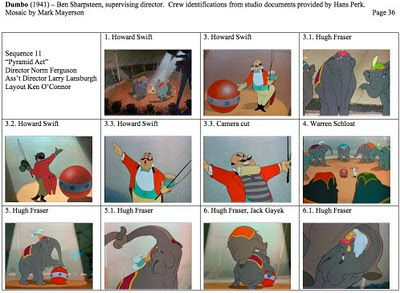 However, Timothy was attempting to launch Dumbo as a success, where the clown is forcing Dumbo to take a pratfall. Finally, Dumbo has a rattle clutched in his trunk where he earlier grasped a flag to crown the pyramid. The actions earlier in the film are replayed here as farce. There's no getting around how lame the clowns are. None of the gags is particularly clever and I think that was a conscious decision on the part of the filmmakers. Had the clowns been genuinely entertaining, the audience would have been distracted from Dumbo's situation and his humiliation would not have been as great. The draft says that the stuff Dumbo falls into is plaster. Ouch. Les Clark handles most of the Dumbo close-ups. In some of them, Dumbo's irises are huge. Was that intentional or were the shots assisted by different artists? Grant Simmons and (probably Ray) Patterson handle the clowns. All the animation has strong poses and good timing. The clown action is often furious, but it all reads clearly. In shots 15 and 19, Simmons does some interesting work with cycles. The design of the clowns' eyes make them closer to automatons than living creatures, as they are expressionless for the most part. The music in this sequence needs to be mentioned. It's fast-paced and slightly discordant. It certainly communicates that the actions on screen are not to be taken seriously. There is no sound from the circus audience until the act ends, when there is applause and whistling. As bad as the act is, the film has to tell us that it is a success so that the clowns' future actions are motivated. 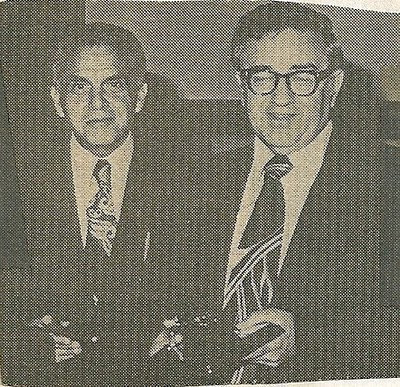 Jack Kirby (left) and Jerry Siegel. Both of their estates are in litigation to recover the copyrights to the comic book characters they created. The comic book business is not the animation business, but both depend on the work of artists whose legal relationship to their creations is often misunderstood or ambiguous. Paul Slade has written a long article on the legal challenges that comics creators have launched against their employers in an attempt to regain ownership of their creations. It brings to mind the quote attributed to Balzac, "Behind every great fortune there is a great crime." The elephants, who have all suffered from the collapse of the pachyderm pyramid, learn that Dumbo has been made a clown and take an oath declaring that he is no longer an elephant. I love the end of shot 13, which is a literal visualization of putting somebody's tail in a sling. 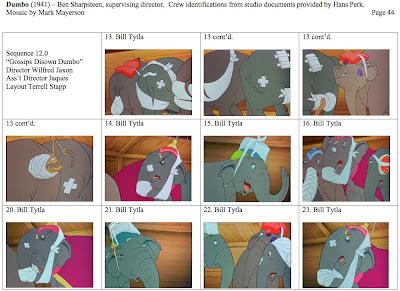 Once again, we have Bill Tytla showing off his versatility as an actor, handling the various elephant personalities and keeping them distinct as individuals. In shot 21, when the Verna Felton character barks, "Out with it!" Tytla animates a great, fast accent on Catty before she reveals Dumbo's fate. Catty typically oozes through her movements, so the accent really emphasizes how surprised she is by the command. Throughout the draft, there are shots that are missing in the final film. 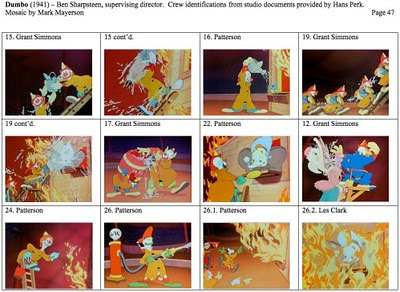 In this sequence, it apears that shots 17-19 were done and then scrapped. They could be as simple as story panels in a leica reel or could be full colour shots. 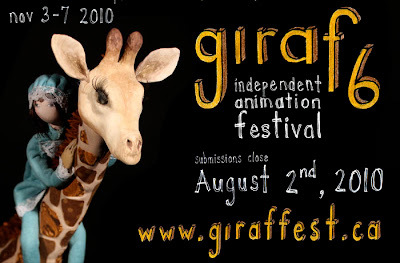 I wonder if there is Tytla animation from this film sitting somewhere in the Disney archives. I'm not aware of anything like that showing up as a DVD extra for this film. As good as Tytla's animation is, the assistant work is lacking. If you carefully watch this sequence and pay attention to the various bandages as the elephants move, you can see that they're not nailed into place. They tend to drift. While it's not enough to bother a casual viewer, anyone with an animation background can spot the problem. My assumption is that this is another byproduct of the tight budget. There is an inconsistency with the elephants' trunks. In shot 16 there is an elephant whose trunk is totally bandaged, yet in shot 24, when presumably all the elephants take the oath, that trunk is nowhere to be seen. There's not much to say about this sequence. The big top has fallen and Casey Jr. slinks away during a stormy night. The colour, the mournful chorus and the rain all contribute to a sequence titled "Sad Casey." Børge Ring emailed me about Milt Neil, who was last seen in this film animating Timothy Mouse. I asked Frank Thomas what became of the fine animator Milt Neil.- "Oh," said Frank. "He went into a Danish restaurant in Hollywood. He met the owners daughter and has not left the place ever since"
Variety is reporting that Starz Media, which consists of Overture, Anchor Bay Entertainment, Film Roman and Starz Animation are for sale. The companies are available as a group or separately. Starz was formerly owned by IDT and before that was Dan Krech Productions. It is one of the larger employers in the Toronto animation business. 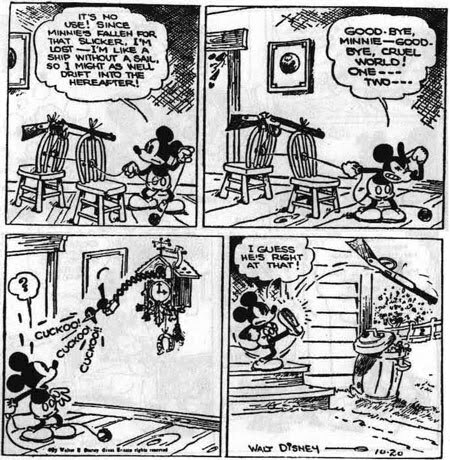 Head over to Joakim Gunnarsson's blog where he posts Disney gag drawings from the collection of Leslie Brooks that are for sale. 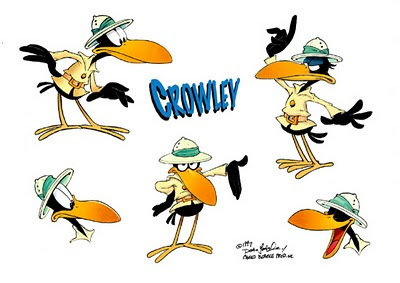 The above drawing is by Fred Moore (featuring a caricature of Ward Kimball). Other drawings are by Jack Kinney, Floyd Norman, Webb Smith, Sid Thorne, Paul Murray, Walt Kelly and Warner Bros. animator Jean Blanchard. I previously reviewed Edward Jay Epstein's book The Hollywood Economist. One of the most interesting things about it was its explanation of Hollywood accounting and why movies never make a profit. Now Deadline Hollywood Daily has printed a profit and loss sheet for Harry Potter and the Order of the Phoenix and it's more of the same. "Though the film grossed $938.2 million worldwide, the accounting statement below conveys that the film is still over $167 million in the red." The film "lost" money because Warner Bros. distribution sucked up all the money, leaving Warner Bros. the producer running a loss. It's a shell game and the pea is never under the producer's shell. I don't know why any independent producer would take a chance on a system that is structurally corrupt. While the web is hardly mature as a distribution medium, its great advantage is that it frees producers from having to deal with distributors. I look forward to the day when film distributors suffer the same fate as record companies. In comments to my post on Toy Story 3, Daniel Caylor asked, "Can you give me some examples of rich characters from animation that have set the bar for you personally?" While animation people are constantly yelling, "story, story story," I think that they have a very limited understanding of certain aspects of it. They understand plot and they understand personality, but I think that animation's understanding of character is pretty perfunctory. Character in animation tends to be linear and go from A to B. Grumpy hates women and ends up loving Snow White. Pinocchio is irresponsible and then he's responsible. The plot moves these characters from one emotional place to another, but their growth is uncomplicated and easy. They don't have to struggle with their emotions in order to grow and don't have to give up anything along the way. It's no sacrifice for Pinocchio to stop being irresponsible. In fact, it's been nothing but a disaster for him. Pixar has done better than average with their characters. In the original Toy Story, Woody has to give up his position in the toy social world and Andy's affections in order to grow. Buzz has to give up his illusion that he's a space ranger and not a collection of plastic parts. Giving up these things is painful but necessary. However, in Toy Story 2, Woody has to give up something he never had: the adulation of crowds of children visiting him in a museum. Jessie has to give up her mistrust of people in order to be emotionally alive again, something that may take effort but is hardly much of a loss. In Toy Story 3, Andy is going to go to college whether his toys are in the attic, donated to the daycare or bestowed by him as a gift. While his choice represents his maturity, it isn't necessary for him to grow in life. For this reason, I still feel that the original Toy Story is the best film of the three. It's the only one where the character growth has real costs . One of my favorite scenes in The Incredibles is when Bob is leaving to go on a mission while pretending to be going to a business conference. His wife Helen is there to say goodbye. The dialogue is totally innocuous but the subtext is illuminating. At this point in the film, Bob's family takes second place to his egotistical need to be a hero. Helen believes he is having an affair. While she is wrong, the scene does show the the emotional gulf between them and their lack of communication. It's perhaps the most realistic portrayal of a marriage in any animated film. Complex characters come from the script, not from the animation, which is why "story, story, story" rings so hollow to me. Look at two live action classics that I hope everyone has seen: Casablanca and The Searchers. In Casablanca, Humphrey Bogart has to give up his romance with Ingrid Bergman in order to grow as a character. However, there's another level present here that's missing in animated films and that's ambiguity. Over the course of the film, the audience learns of Bogart's strong feelings for Bergman but also learns of his hatred of fascism. Bogart rigs a roulette game so that a young wife doesn't have to sleep with a government official in order to buy an exit visa. He approves of the playing of La Marseilles in the presence of Nazi officers. Until the end of the film, the audience is not sure what Bogart will do. There are several possible endings and all of them are believable based on the events of the film. In The Searchers, the John Wayne character is both attached to his brother's family (in particular his brother's wife) and has a maniacal hatred of Comanches. When his brother's family is murdered, the women raped and his young niece abducted, he spends 10 years searching for her. The audience is not sure what he will do when he finds her. Will he rescue her or kill her for having been "defiled" by living with Comanches? Animated films tend to be plot heavy and because they are generally family friendly, the endings can be taken for granted. Suspense lies in how the characters will reach the happy ending more than how the characters will grow. Plot dominates character, where in the best live action films, character dominates plot. Indeed, plot should be growing out of what characters want. 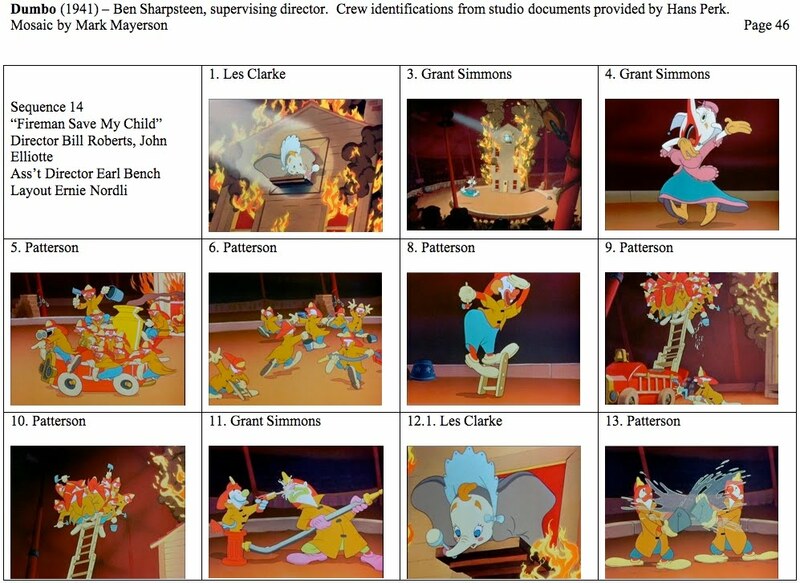 In too many animated films, the characters are initially passive and simply respond to events the plot sets in motion. That's the case in all the Toy Story films. 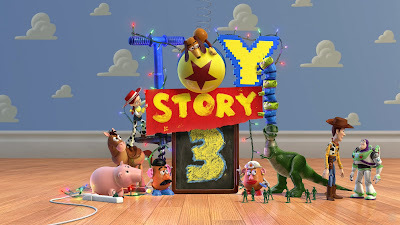 Watching Toy Story 3, I think I'm getting a clearer understanding of Andrew Stanton's contribution to Pixar. While most people are comparing the latest Toy Story to the two previous films, it seems to me that the new Toy Story relates most closely to Finding Nemo and Wall-E, two films directed by Stanton. Stanton is listed as one of the writers on the latest Toy Story. Toy Story 3 resembles Nemo in that it is about moving to a new stage of life, where old relationships cannot stay the same. Marlin has to loosen his grip on Nemo in order for Nemo to grow. Andy has to let go of his childhood in order to become an adult; the toys have to accept that their time with Andy is over. Both films (and many of the Pixar features Stanton has contributed to) deal with separation. Stanton was adamant about Wall-E not being an ecological fable, yet Toy Story 3 takes the characters to a dump, an endless stretch of society's garbage. It's the kind of place that Wall-E would work. Clearly somebody at Pixar is uncomfortable with the detritus cast off by our consumer society, and based on Wall-E, I'm guessing that it's Stanton. I wonder, too, if it isn't a subversive cry from the heart, disdaining the endless merchandising that Disney grinds out in the wake of Pixar's creations. At some point, I very much hope that somebody writes a book about the Pixar brain trust similar to John Canemaker's book on the nine old men. While most of the attention has focused on John Lasseter, I suspect that others in the company have had an enormous effect on the shape of the films. Cars, directed by Lasseter without contributions from Stanton or the late Joe Ranft, is the least interesting Pixar feature for me. I think Wall-E is a mess, but at least there are ideas in it; Cars is hollow. I'm looking forward to John Canemaker's book on Joe Grant and Joe Ranft for learning more about Ranft. I wonder if Stanton and Pete Docter will ever come out from behind the Pixar public relations machine to emerge as individuals. We may have to wait until they are retired or dead before people are willing to speak openly. I found Michael Sporn's comments on the film interesting. I agree with him, but I think what Toy Story 3 is was inevitable. I can't remember if I wrote about this for this blog or for Apatoons, but there is a difference between character and personality. In a single dramatic work, characters change. They start in one emotional place and at the end, the events of the plot cause them to grow into something else. However, as soon as characters are used repeatedly, whether it's for sequels or series, they can no longer change without threatening the aspects that have made them popular with audiences. They are reduced to personalities -- a collection of traits to be trotted out for the audience's satisfaction. Homer Simpson can never really learn anything, or if he learns something it has to be forgotten by the start of the next episode. If he does change, he's no longer Homer Simpson. The Toy Story characters have become personalities due to their sequels and the forthcoming shorts. As a result, changes have to be superficial, like Spanish Buzz. That's not growth, it's a quirk. The only characters who really change in this film are Andy and Ken. It's a shame that Andy is dropped from the film when he discovers that his toys have been donated. There's no sense that he's upset or conflicted. He doesn't attempt to recover the toys. It's only at the end that we get any insight into his thoughts and while they're poignant, I think the film missed an opportunity by not giving him more screen time, especially since he seems to be written out of the series. That provided a real opportunity to take Andy in new directions without hurting the franchise. I wonder if Pixar will receive any flak from the gay community over Ken, not due to how he acts but how other characters react to him. The bookworm's reaction to seeing the high heels and the toys' reaction to his handwriting are less than generous. Still, Ken is one of the few characters in this film who grows, coming out of the closet by going into his closet. Is there anyone making films now, live or animated, who relies as heavily on sentiment as Pixar? I've stopped following Hollywood films for the most part, but I'm guessing the answer is no. Pixar is clearly filling an audience need, one that Hollywood used to dish up regularly. The fact that other studios (like Disney) are not capitalizing on this seems odd to me. There's no question that Pixar has leveled off, though certainly at a high level. It seems all animated features have also leveled off in that while there are good films and bad, there are no real surprises and no new directions. Nothing stays the same forever and things could possibly get worse, but I do wish that somebody would go deeper into character. There's uncharted territory there for animation; theatre and live action have proven how rich that area is. How many elephants in a pyramid? In shot 1, there are eight elephants standing around the ringmaster. In shot 4, there are seven around the ringmaster. 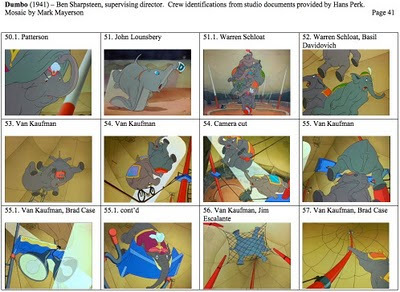 In shot 23, the pyramid consists of six elephants. In shot 40.1, there are eight elephants in the pyramid. In shot 41.1, there are seven, as there are in shot 51.1. 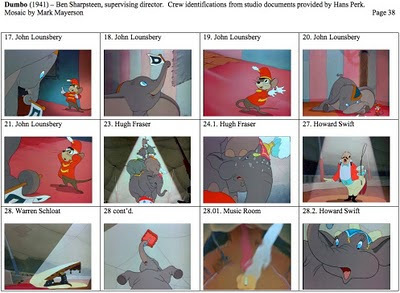 All of this takes place before they trip over Dumbo and scatter, so the number should be consistent. Hugh Fraser does excellent work in this sequence. He manages to capture the drawing and the personalities of the elephants in a manner consistent with Bill Tytla's work. He does that while dealing with multiple characters whose weight must be animated believably or the sequence loses its effectiveness. Shot 10.2. gets even more complicated with one of the elephants being swung towards and away from the camera, adding a size change to the rest of the difficulties. While Fraser has Tytla's work as a template, the animation challenges here are possibly greater than Tytla's with the same characters. Warren Schloat, Ed Dunn, Van Kaufman and one of the Patterson brothers (the draft doesn't specify if it is Ray or Don) handle similar shots, but they don't have to deal with dialogue or personality. 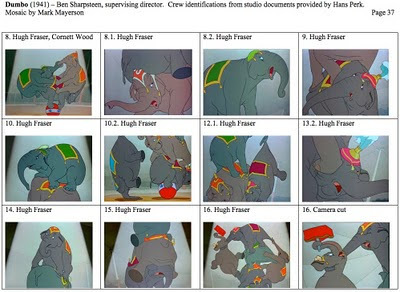 Due to the action, I'm guessing that the elephants often had to be animated on a single level of paper. That makes timing and revisions extremely difficult. Timing is critical to the portrayal of weight, so I'm sure the animators had to plan these shots very carefully. Make no mistake, the pyramid and its collapse is a very difficult animation challenge. Howard Swift handles the ringmaster for the most part and does it well. Looking at this, I wonder if he animated the sleeping ringmaster in the previous sequence. The ringmaster reacting in shot 42.1. by Ed Dunn is definitely inferior quality, with the ringmaster coming to a dead hold before dropping off screen. John Lounsbery animates Dumbo and Timothy. His drawing is very appealing. 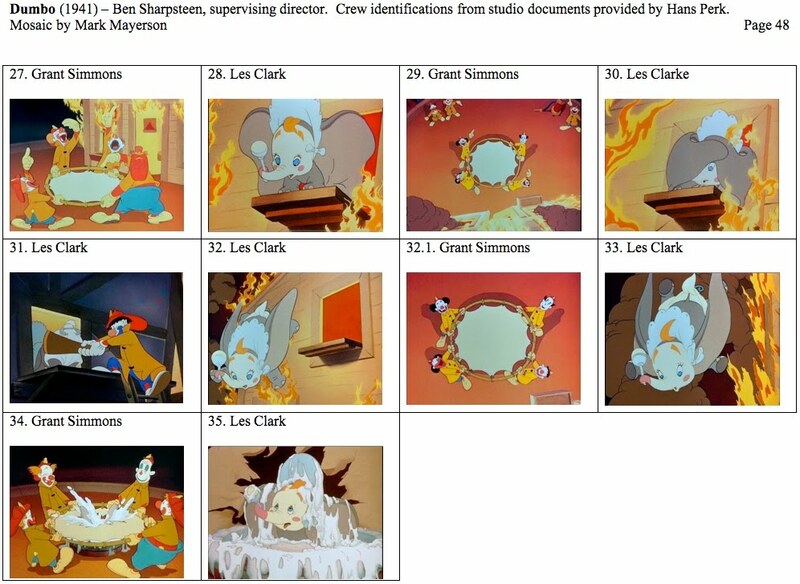 He captures Dumbo's cuteness and panic equally well. 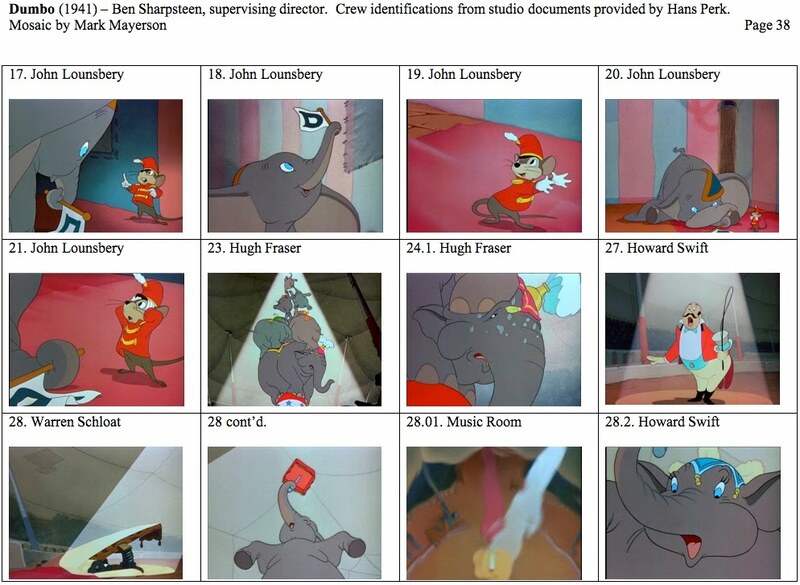 Dumbo's stumble and fall in shot 51 is beautifully done and is worth studying single frame. And "Out of my way, assassin!" has to be one of the greatest lines of dialogue ever.